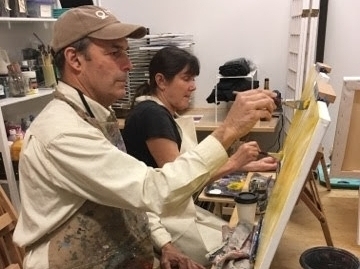 Join Tinker on the 1st, 3rd, and 5th Friday nights of the month for a fun and casual BYOB painting workshop! Grab a friend or come and make some new ones. 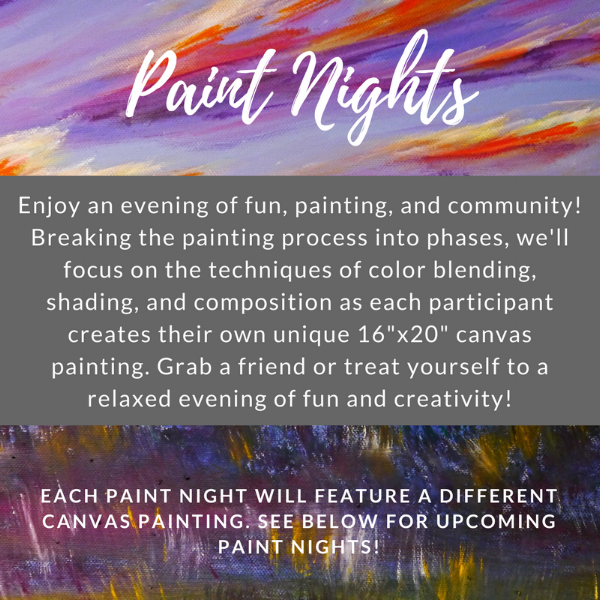 Check out our offerings below, register for your favorites, then mark your calendar and look forward to your Art Night! 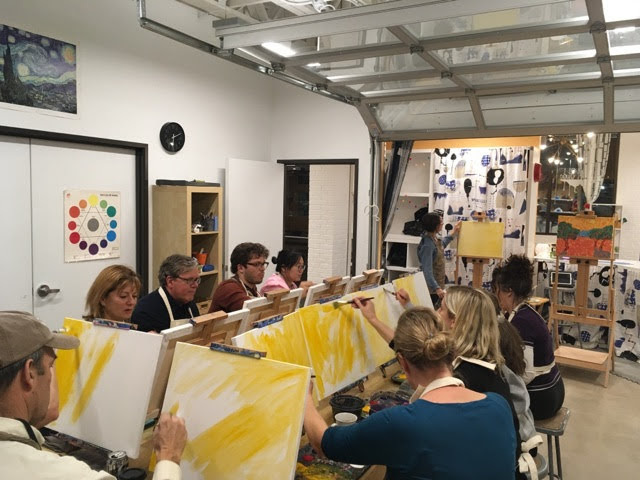 Inspired by famous artists and upcoming events in Colorado, many of our Friday Art Nights pair well with a trip to a Denver Metro museum! 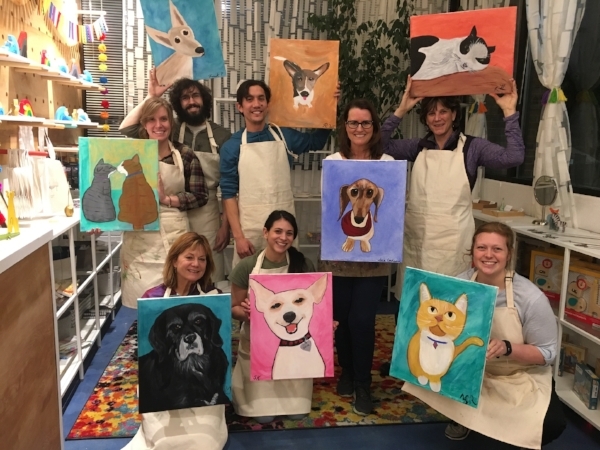 Register for a Friday Art Night! Inspired by Van Gogh, painted by Erica. Use the colors and line quality of Van Gogh while creating this spring time flower scene. We are getting excited to flowers to come up, warmer days and the beautiful colors of Spring here in Boulder. 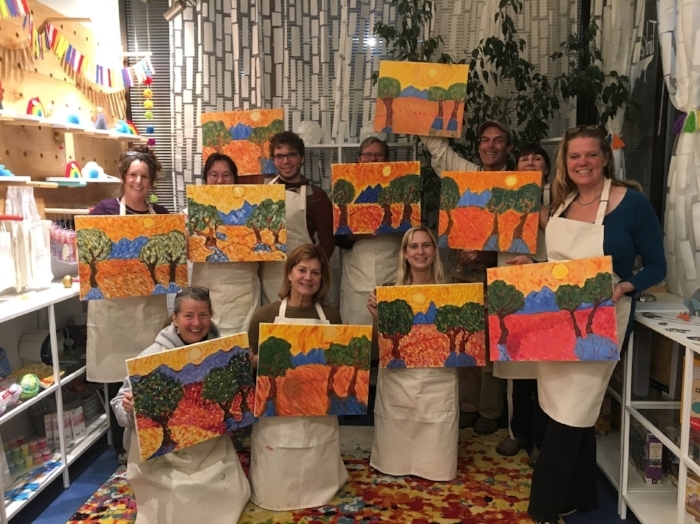 Join us to explore Van Gogh and impressionism! Theibaud, Wayne. Tulip Sundaes. 2010. Theibaud is known for his unique color palette and fun style. As we get closer to summer, get excited by painting tasty treat. This painting can easily be hung in a kitchen or dining area and are sure to make mouths water! Kahlo, Frida. Self-Portrait with Thorn Necklace and Hummingbird. 1940. Kahlo is known for her strong self-portraits, unique use of symbols in art and different flora and fauna in her paintings. Use these elements for inspiration while learning more about Frida’s style. Explore using some of her common elements such as a unibrow and plant leaves while creating your own unique painting. Bring a photo of your dog or favorite pet! We'll guide you through using your reference photo to paint your very own, custom Pet Portrait. Furry friends need to stay at home, but they are sure to be thoroughly impressed when you show them their portrait! Bob Ross was the original Paint & Sip style teacher! Come celebrate his legacy, paint some happy trees and head home with a beautiful landscape. Play with brush strokes, layering and peaceful colors while exploring Ross’s style. A minimum of 4 students must be enrolled in order for Art Night to be held. We will notify you if your Art Night might not run due to low enrollment. Payment will be refunded in full if Art Night is cancelled due to low enrollment. Payment is due in full at time of registration. In the event of a student cancellation, your payment will be refunded, minus a $12 non-refundable deposit, up to 7 days prior to the start of class. Within 7 days of the class start date, payment is non-refundable.